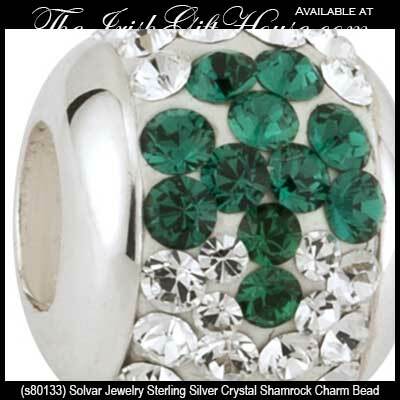 Solvar Irish Jewelry, Sterling Silver, Shamrock Charm Bead with Green and White Crystals. This sterling silver Celtic bead from Solvar features gold plated Claddagh symbols and green enamel accenting. This Celtic bead is a sterling silver dangle shamrock bead that features green crystals. This Sterling Silver Celtic Trinity Knot Charm Bead from Solvar Irish Jewelry has green enamel accents. 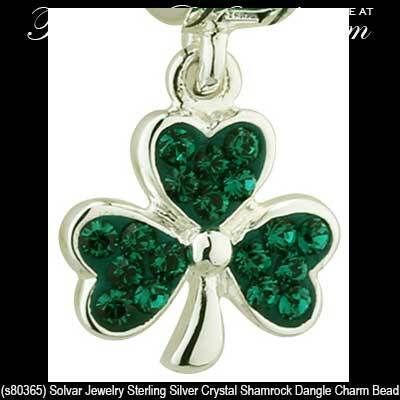 Sterling silver dangle shamrock charm bead from Solvar has green enamel leaves. This Celtic charm is a sterling silver bead with gold plated shamrocks. Sterling silver dangle Claddagh charm bead with enamel accents from Solvar. 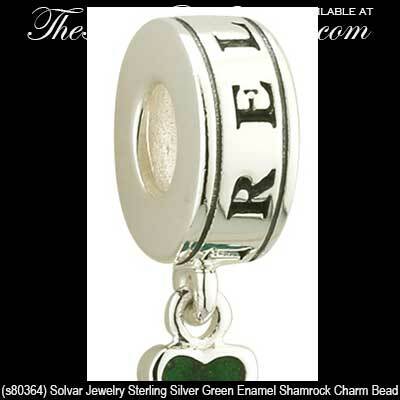 Sterling silver Claddagh charm bead with green crystal hearts from Solvar Jewelry. Sterling Silver, Enameled, Celtic Trinity Knot, Celtic Spiral and Shamrock Charm Bead. This sterling silver Celtic charm is a bead with a row of gold plated shamrocks. This Celtic bead is a sterling silver Claddagh charm with gold plated hearts. Sterling silver Celtic bead with a gold plated accented Trinity knot charm. Sterling Silver St. Brigid's Cross Charm Bead with Green Enamel Accents from Solvar Irish Jewelry. Sterling silver Celtic love knot dangle charm bead with a Trinity knot and a gold plated heart. Sterling silver Celtic bead is in the shape of a four leaf clover charm that is accented with green enamel. 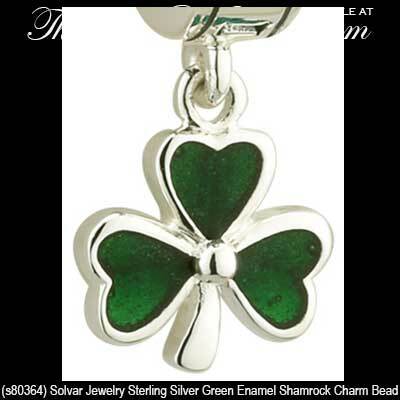 Solvar Irish Jewelry, Sterling Silver, Shamrock Charm Bead with Green Enamel Leaves. Celtic Christmas tree charm in sterling silver features the Trinity knot. Sterling silver Celtic snowflake charm bead with Trinity knots from Solvar. Our collection of Celtic charm beads are designed to be worn on the wrist after sliding them onto a bracelet; this style of Irish jewelry is only one of the many selections we have for you to adorn your wrist. You may also wish to consider our collections of Celtic bracelets and Celtic bangles that we offer in gold, silver and plated designs. Additionally The Irish Gift House offers various Irish designs that include Claddagh bracelets and shamrock bangles; these collections are offered as link and cuff styles and are also available as the popular Irish charm bracelets with expandable wire. Many of our other collations, such as the History of Ireland and the Book of Kells, also feature Irish bangles; you will also find that our assortment of Connemara marble bracelets is unmatched and offers a wide selection that is crafted by several different Irish jewelers. While not as vast an assortment as the Tree of Life necklaces or the Tree of Life earrings, we do have for your perusal, a selection of Tree of Life bracelets too. And don't forget the wee Irish babies and children, as we also have smaller Celtic bangles within our Irish baby jewelry section. 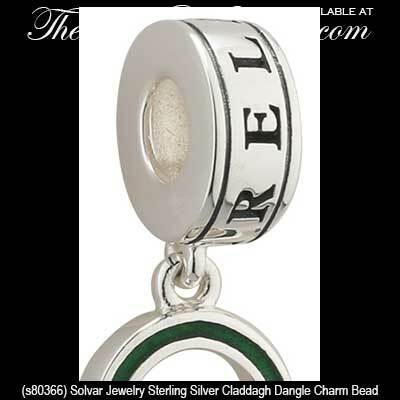 The assortment of sterling silver Celtic charm beads is made in Ireland by our flagship Irish jeweler, Solvar.